February Amazon Gift Cards Giveaway! It’s February and I’m in the mood to have a giveaway! Why not, right?? 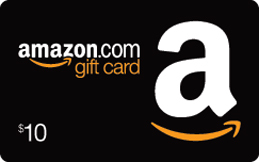 This month, I’ll be giving away two Amazon gift cards valued at $10 each. So be sure to share this with your friends and don’t forget to visit this page daily so that you can get additional entries! The raffle will end February 28, 2014 and winners will be announced on March 1, 2014. Cut my soda out.. Needing to focus on daily workouts and cutting carbs more.. Bench my weight. Benching every m w f and eating in moderate proportion. I need to increase exercise and decrease snacking. I am stopping myself from buying sugary snacks and instead fruit and veggies and taking 1 hour to start out of my day to walk.